In this blog you will learn what mental Aikido is, why it is a mindfulness practice and a recent example of perfect mental Aikido that went viral on the internet. Mindfulness practice embraces our entire life. How do we use it with other people? For most of us we communicate with others all day long. We talk in person or over the phone, we email, text, post on Facebook, we talk through our facial expression and body language. Just as with other situations we can employ our mindfulness practice to either react, which is usually rather mindlessly and based on habit, or we can respond in a way that feels like a choice and more aligned with our values. In MBSR (the Mindfulness-Based Stress Reduction program) we dedicate one class session to mindful communications. We divvy up different communication styles into the very simple model of “passive, aggressive and assertive”. It is less about passive and aggressive being wrong and assertive being right, but more about becoming aware of how we interact with whom – and the outcome of those styles. When Jon Kabat-Zinn, the founder of MBSR, came up with this class module he was an enthusiastic student of the martial art Aikido. In Aikido one never attacks but only uses the skill to defend oneself. And one does so by rendering the attacker harmless by using their energy, ideally without causing harm to neither. In mindfulness we mostly explore communication in the verbal realm, not so much the physical. We all have an idea about what an assertive communication looks like, but I find the simile of Aikido particularly helpful. In my opinion there are two main elements that make mental Aikido so powerful. First, you take the attacker by surprise. You just don’t do what they expect you to do. And secondly, you don’t respond back aggressively, which adds to the surprise. Both elements together make it likely that the attacker is thrown off-balance and something new can happen. How do you do that when somebody attacks you verbally in person or maybe in an email? This is the topic of lots of discussion in the class. But we usually come to the agreement that being mindful in the moment is crucial. When we bring mindfulness to the encounter we are not caught in the story and the aggression of the other person. Being mindful doesn’t mean that we are not hurt, annoyed or even scared by the attack, but mindfulness keeps us from reacting mindlessly. We don’t move into defending ourselves in an automatic way by either withdrawing (passive) or fighting back (aggressive). To put it into physiological terms: we are not reacting from the fight or flight reflex that is triggered by the aroused amygdala in our brain, but from a response that is mediated by at least some activation and governess of the prefrontal cortex. And this week I came across a public example of the perfect mental Aikido. A couple of weeks ago Honey Maid came out with a new 30sec ad for their crackers. It shows kids and parents being happy together and eating the brand snacks. The tag line is “No matter how things change, what makes us wholesome never will”. Nothing unusual so far. But the big difference lies in the parents shown in the clip: A gay couple, bi-racial couple, a heavily tattooed parent, a military family. And boy, not everybody was happy with that ad. 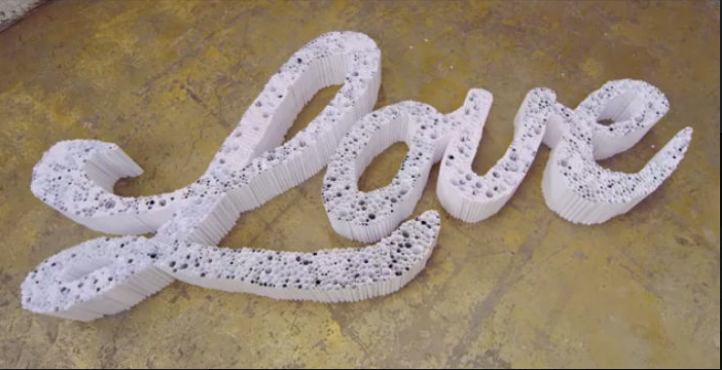 Honey Maid received tons of hate mail. And this is where the mental Aikido comes in. The more mindless reaction could have been to either pretend it didn’t happen (passive response) or to write a more or less angry/upset statement defending their point of view (aggressive response). Or maybe a passive-aggressive mix of both. They chose to do neither. Watch what they did instead. Instead they hired two artists who printed out all hate mails, rolled them up (with the writing facing inwards) and glued them together to make a beautiful sculpture of it that says “Love”. And then they printed out all positive responses they got – which where 10x as many as the negative ones. They rolled them up with the print facing outwards and glued them embracing the hate mail. That made one big, powerful, beautiful art installation. The result? The clip immediately went viral on FaceBook and other social media. The original ad received more than 5.5mio views in one month, the Aikido ad more than 3.5mio views on YouTube in 6 days. Not exactly what the hate mailers had hoped for. That to me is an example of perfect mental Aikido. What do you think? What’s mental Aikido for you? I’d love to hear from you. Touchingly beautiful piece Christiane. Thank you so much for sending this. I am forwarding it to all I know. Thank you so much, Sharon. I’m glad it resonates with you.